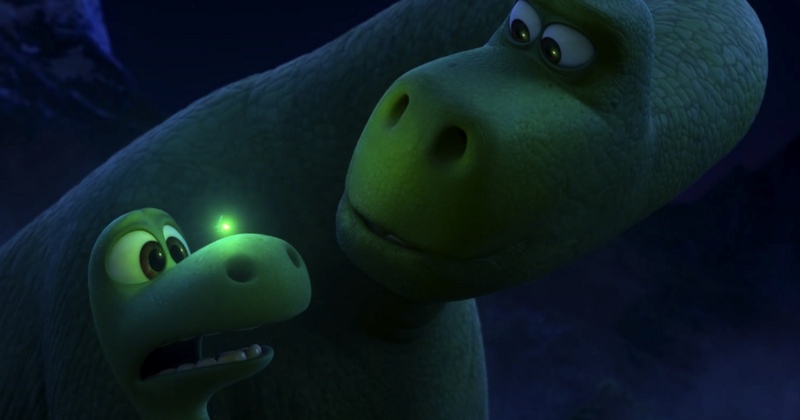 I began to worry about The Good Dinosaur the more I heard from & saw about it, becoming concerned that we were getting a dino version of Ice Age, which we all thought was funny, but I doubt many of us have the desire to see constantly remade. After all, these are talking dinosaurs cracking jokes, going on adventures, like a cheap knock off of The Land Before Time, which is not what we signed up for when allowing ourselves to get excited about a Disney/Pixar movie. The early teasers & trailers made the film seem beautiful, natural, emotional, and that’s what I wanted to be given, not Madagascar set in the Cretaceous period. But I am overjoyed to announce that none of my fears were realized. This isn’t a dino movie, this is alternate history, and these creatures aren’t just trying to survive, they are evolving before our very eyes. What if the theoretical asteroid that disrupted the planet and ultimately led to the annihilate of Earth’s dominant species had missed us? What if dinosaurs had never lost their rule, but instead had evolved into the powerful, intelligent leaders of the planet? Well, imagine no more, here is a look at an alternate reality, one in which dinosaurs plow the earth, create religions, drive cattle, and develop loving bonds. Arlo is a young Apatosaurus whose family respects hard work & making your mark on the world. Unfortunately for Arlo, he’s weak, scared, underappreciated, and doesn’t know how to prove himself to the others. He can’t even kill the strange “critter” who seems to be stealing the family’s food, falling into the river instead and becoming swept away. Arlo and the critter will have to team up if they want to get home alive, creating a special relationship that only exists between two creatures who desperately need each other. I was shocked by the story, had no idea that this wasn’t a movie about dinosaurs millions of year ago who could talk and employ prat falls. Instead, it was a modern day tale with dinosaurs as the lead players on a global stage, with humans as animals that lived on the fringes. And, even more surprisingly, it was a Western, complete with homesteaders, rustlers, cowboys, varmints, cookfires, campouts, and journeys home. It was as if Pixar took the classic Western tale, the one we’ve heard a hundred times but still love, and replaced every human with a dinosaur, every wolf with a human, and every other animal with a slightly stranger version of itself. It was a shocker to me, perhaps not to everyone, but played out as an extremely interesting concept, one that transitioned surprisingly well from old standby to original feature. But the plot wasn’t even the best part, that was simply comfortably normal. What really shined was the animation. Never have I seen nature scenes depicted so brilliantly, with eye-popping colors and movement that you would swear was real. 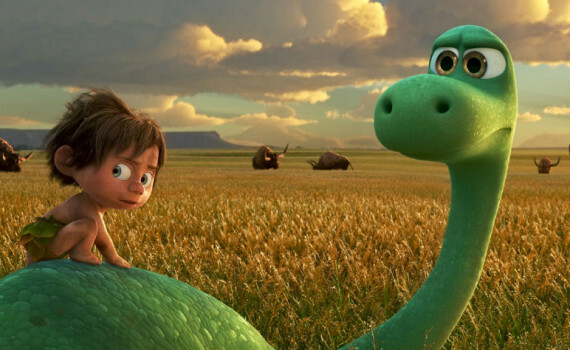 Rolling western landscapes wherever you turn your head, rocks & grasses created with perfect detail, creatures of all shapes & sizes tremendously crafted; The Good Dinosaur is a stunning visual from start to finish. It might lack the emotional depth of Inside Out and perhaps relies too heavily on the typical boy-on-an-adventure-who-makes-a-friend concept, but for most audiences (especially young ones) a little classic setup only helps with enjoyment. The film was enjoyable beyond a doubt, if not the poignant Oscar-winner that we’ve come to expect when we sit down for Disney/Pixar. Lower expectations a tad, because this isn’t WALL-E, but enjoy a solid bit of entertainment for the whole family.